Press The Train list button to see all your trains. Trains can pick up jobs in each city. Tap the job to load it onto your train. Only one train can operate on each rail section. To expand your empire, build some new track in between to cities. Building a track from city to another city will cost coins. Train parts are found in crates. Creates show up in cities like other jobs. Turn some parts into a new engine. 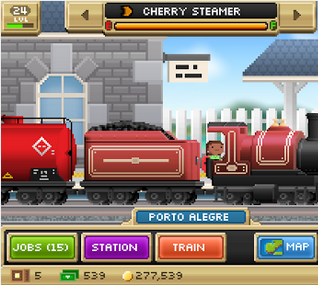 Pocket Trains can be played offline and since it is offline, you can manipulate your smartphone/tablet's time to remove any time limits in the game. Open Pocket Trains to make sure if it is working. Exit and force close Pocket Trains. Change your time into your current time and date. Open Pocket Trains to make sure that there is no problems.